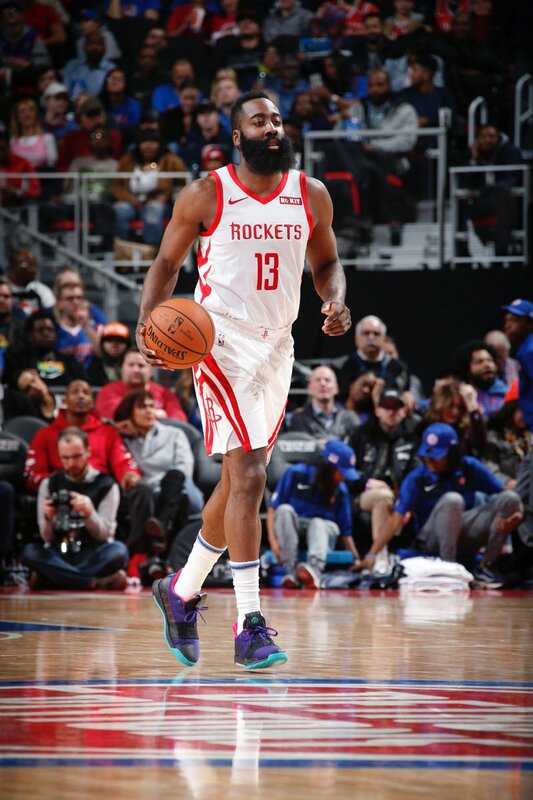 With a tough overtime loss to the Detroit Pistons, the Houston Rockets have lost their first game to an Eastern Conference opponent. It was always going to happen eventually, and the previous game against the Pistons provided a preview to which team was likely to take that trophy. Now the Rockets fall to 9-8 on the season and back out of the playoff picture at the moment, and back onto their rocky road up the standings. It's fitting that Blake Griffin again attacked with late game three point prowess. He nearly stole the previous game with five threes in a row, and tonight he saved the game for the Pistons by hitting a long three with mere seconds left on the clock to take a lead. Eric Gordon hit an incredible layup to force overtime, but it was not to be. Foul trouble and poor play from James Harden in overtime combined with red-hot shooting from Reggie Jackson, and that was that. This game saw the Rockets fall behind early and fight back, in large part behind the play of Clint Capela (29 points, 21 rebounds). The biggest culprit which landed them in a hole was their inability to hit three point shots. When the Pistons then lost the ability to hit three pointers as well, the Rockets took a lead. At the end of the game it devolved, as all single-possession games do, into a coin flip. Blake griffin made his shot, and Gordon made his, and it came out to a draw. This was a game which, as part of a larger season, isn't of much concern. Blake Griffin and Andre Drummond are unusually well-suited to preventing the Rockets from unleashing the full power of their small lineups. The interior defense was solid from Detroit, and if at any point the threes start missing, that lands Houston in a pile of trouble. Houston's defense also suffers them switches can actually be effectively taken advantage of by a larger, stronger opponent inside. Not many teams can boast this advantage, and it's why for the last few years teams like Miami, Memphis and New Orleans have played Houston tough, no matter the gap between the teams. At the micro scale, however, this game stings. Houston was an inch away from a 6-game winning streak and a record good for 7th at the moment instead of 9th, and a mere 1.5 games back of 1st. As it is, the Rockets have to continue winning at a herculean clip to climb in the standings at all, as every team in the west continues to roll on. Currently four teams are all exactly tied for the top seed in the conference, and none of those teams are Golden State, Houston or Utah. In this bizarre season, the Rockets are going to have to keep winning at the ridiculous clip they've been at since they started the year 1-5. Apart from this game tonight, lately they've looked ready for the task.